Marsh might begin with close observation, but he ends up in a fever dream — a garden of otherworldly delights. HUDSON, New York — I have been doing my best to follow Joshua Marsh’s work ever since I wrote about his first solo show, Ten Things, at Jeff Bailey Gallery (September 7 – October 10, 2010) when it was still located in New York City. I wrote about his second New York solo, As If (2013), also at Jeff Bailey, and included his work in a group show, Painting is Not Doomed to Repeat Itself (September 24 – October 31, 2015) at Hollis Taggart Gallery. Marsh belongs to a small group of artists that I try to track because I believe there is something special and particular about their work. This has nothing to do with success, styles, trends, or the marketplace — all of which are false barometers. If you are a poet and think about these measures you are doomed. I feel this way about the work of Elliot Green, Tom Burckhardt, Angela Dufresne, Michele Segre, and Barbara Rossi, all of whom are older and have gained more attention than Marsh. As far as I am concerned, each of these artists is still flying under the radar and deserves much more consideration. Despite their obvious differences, each of them channels a kind of coruscation, a flash of light, into their own distinct visual language. This is the tipping point that we have reached in art. Despite the many museums that cling to disproven narratives, art no longer adheres to institutionally approved styles or a supposedly shared history. It is instead about clearing a path that no one else might be on, without relying on an established precedent to support your decision, because in the end that is just being cowardly. This is why certain individuals were considered artist’s artists (Thomas Nozkowski, Catherine Murphy, Patty Chang, and Stanley Whitney) long before they gained any kind of institutional endorsement. So now you have an inkling as to why I traveled two hours north to see Joshua Marsh: Paper Garden at Jeff Bailey Gallery (August 12 – September 17, 2017). This is the second show devoted solely to Marsh’s drawings, and because I did not go to the earlier one at the same gallery, I was not going to miss this one. While Marsh works within what could be loosely called the territory of landscape and still-life, he still manages to do something that stretches our understanding of these conventions into new places. Marsh might begin with close observation, but he ends up in a fever dream — a garden of otherworldly delights. 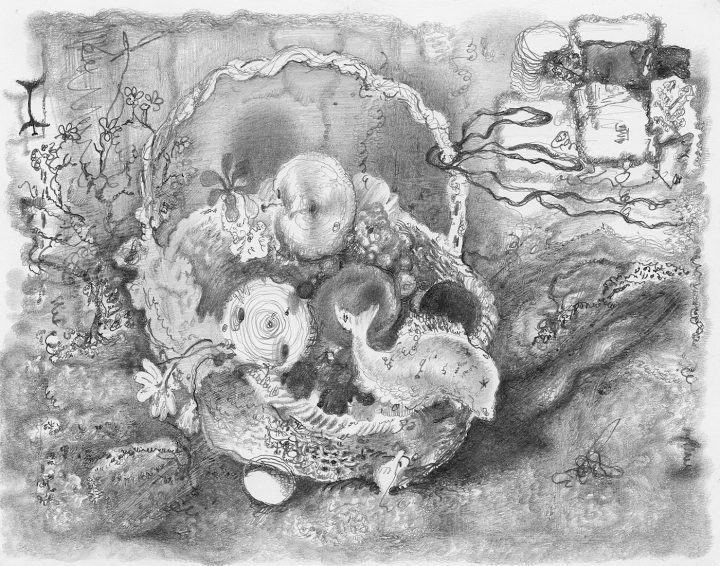 Marsh began the 15 drawings in the exhibition, none of which is larger than 11 by 13 inches, when he spent two months as an artist in residence in the Troedsson Villa in Japan, which is located on the grounds of a former temple in Nikko, a city north of Tokyo and a UNESCO World Heritage site. According to the catalogue accompanying the exhibition, Marsh brought “two different weights of graphite pencils” and “paper scaled for easy transport.” He continued to work on the drawings after he returned to America once his residency was over. Marsh possesses one of the largest vocabularies of mark-making that I know of. He can move from subtle shading and tonal shifts to tiny squiggles and scribbles in the blink of an eye, from masterly draftsmanship to the cartoony. He evokes the surfaces and textures of stones, leaves, tree bark, moss, mist, and pools of water. He possesses the imaginative ability to infuse his stones with anthropomorphic qualities. His sensitivity to the tonal possibilities between pale gray and gritty black enables him to convey indirect light and mist, the sense of being in an enclosed world. The concentration that is needed to make these drawings is incremental. There is no way that he could have conceived them in advance, as he brings together observation and fantasy, the seen and the imagined. Once you notice the skull lying on the ground on the right side of “Perimeter” (5 ½ by 7 inches, 2017), you begin to pour over the drawing with renewed scrutiny. Look at the stones stacked on the left side of the drawing. Are we looking at a wall or a totem made of stones? 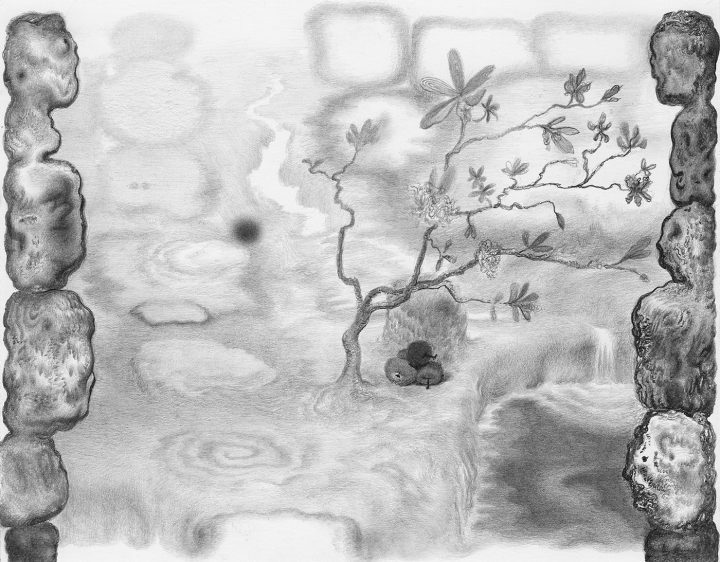 Marsh can change scale and perspective within a drawing and make everything feel necessary, as in a dream. This means that you accept the fruit and fish in “Basket” (5 ½ by 7 inches, 2017) with the same equanimity as the gathering of abstract lines and hinted shapes in the upper right hand corner, into which Marsh deftly directs our attention by depicting a ribbon tied to the basket handle and partially fluttering over the abstract shapes. 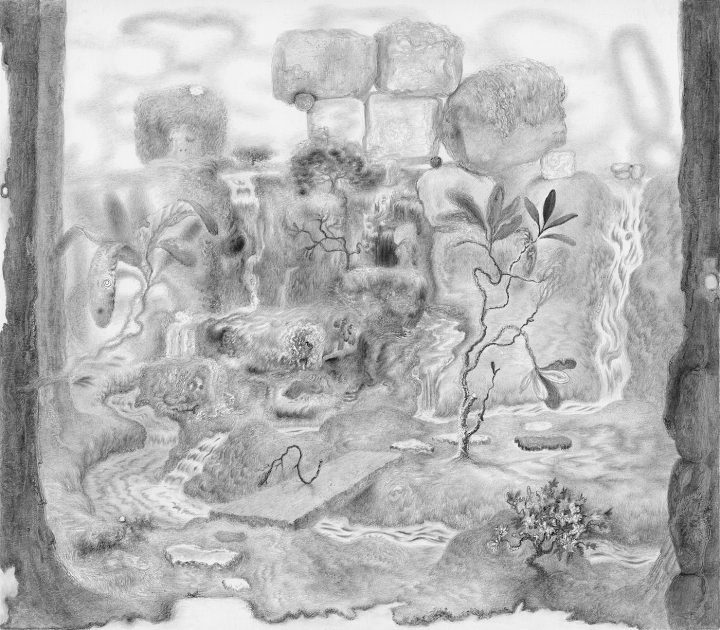 In “Glimpse” (10 ½ by 8 inches, 2017), which is the darkest and moodiest drawing of this extraordinary group, there is a tree trunk paralleling the drawing’s right border; Marsh pays notable attention to the bark of the trunk, which rises sturdily from near the bottom of the sheet until it is cropped at the drawing’s top. On the left side, Marsh has stacked three linear, twisted saplings with trunks of varying widths. The skinny one at the top balances a rectangular stone on the crown of its bowed branches, like an acrobat trying to pass as a weightlifter. 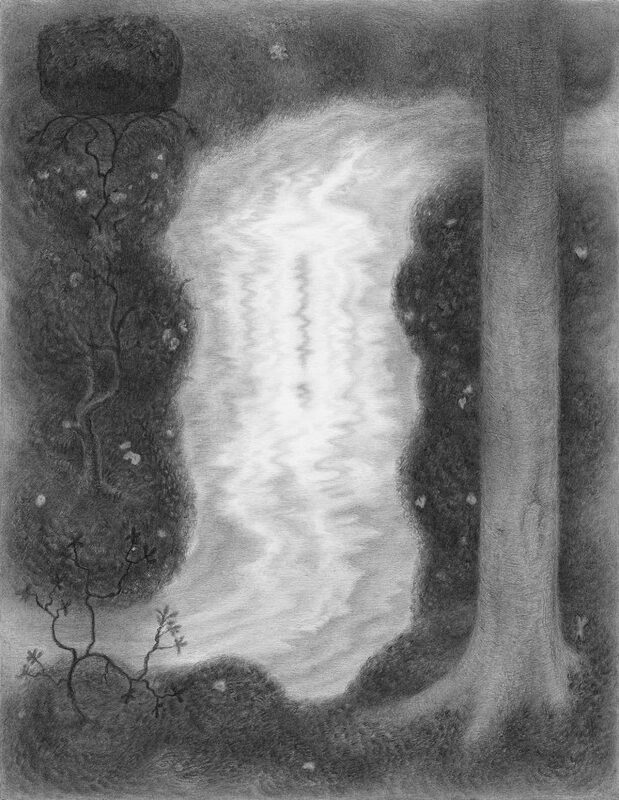 Between these two very different yet bonded ways of drawing, each of which activates the space around the form differently, Marsh depicts an ethereal, ghostly stream that enters the composition from the lower left edge, widening in girth as it moves partway up the paper before diminishing in size and moving toward the upper right edge, behind the tree trunk. Marsh did not simply observe the ancient gardens, with their stones, moss, and trees, while he was in Troedsson Villa; he also absorbed the work of such artists as Hokusai and Yoshitoshi, the former for his landscapes and sensitivity to weather, and the latter because of his penchant for ghosts and demons. We don’t like to talk about skill, perhaps because to do so summons associations with the kind that is mechanical and robotic, and easily mimicked. Marsh’s skill is of a different order, as it is a synthesis of intellect, passion, rigor, and visual acuity. This rare combination is what he shares with Georges Seurat, Edwin Dickinson, and Catherine Murphy. He is a modern master who draws by feeling his way across the paper without ever knowing what he might do next. His commitment to plain, inexpensive, widely available materials is ethical and aesthetic, and certainly not about promoting class difference or celebrating one’s entrepreneurial shrewdness. Most importantly, his sensitivity to pressure, texture, tonality, and line — to being open and alive in time — is always in service of the possible. Joshua Marsh: Paper Garden continues at Jeff Bailey Gallery (127 Warren Street, Hudson, New York) through September 17.